In the fall of 2016 I worked with Sagrada Familia as a TFI fellow. La Comunidad Sagrada Familia is a school for 1200 children and has a residential program for students who cannot live at home, either because of problems in their family or because they are from a province outside of Lima. I spent two months focused on direct programming for the youth. I taught English classes and ran leadership workshops during the school hours. I also helped with general operations of the home (meal prep, games and trips outside of school, tutoring, etc). In a typical day I woke up around 6, helped with a morning English class, had breakfast with the students living there, did lesson prep and taught my classes, and supervised lunch. In the afternoons I would teach my other classes and supervise tutoring (between 3:30 and 5), then have some downtime before dinner, then eat and run or tutor with kids after dinner. It was very different from other jobs I have had, where I have worked with kids but not consistently all day. 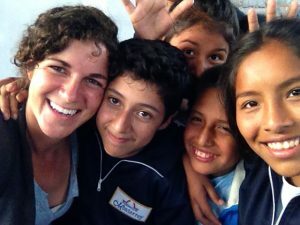 It was challenging at times to adjust to some aspects of Peruvian education. The school was much more militaristic than I had experienced, but by the end I found a balance between discipline and positive reinforcement that worked well for me and my students. For two weeks of my time, I had the opportunity to supervise the senior class trip to Machu Picchu. Before the trip, I helped with their fundraising efforts and raised a portion of their fees. We spent a lot of long hours on buses, and backpacked between different towns in Cuzco stopping for a lot of selfie breaks in between. It was exhausting and exhilarating to explore a new part of Peru with 60 teenagers, and I loved every minute of it. Myself and another chaperone mainly chaperoned the girls, making sure they were ready each morning and doing well throughout the day. The students’ flexibility and positive attitudes continually impressed me, even when they were exhausted from sleeping on the floor and hiking all day. The other highlight was getting to know the students who lived on campus. I loved working with them and hearing about their journeys and goals. Many had chosen to come from the provinces of Peru to study here so that they could more easily continue to university. They had a great love for the community and supported each other as family. This experience was really illuminating for me and has been so helpful in shaping my goals to work as an advocate and counselor for young survivors of violence. I would recommend it to anyone with an open mind and personal drive.